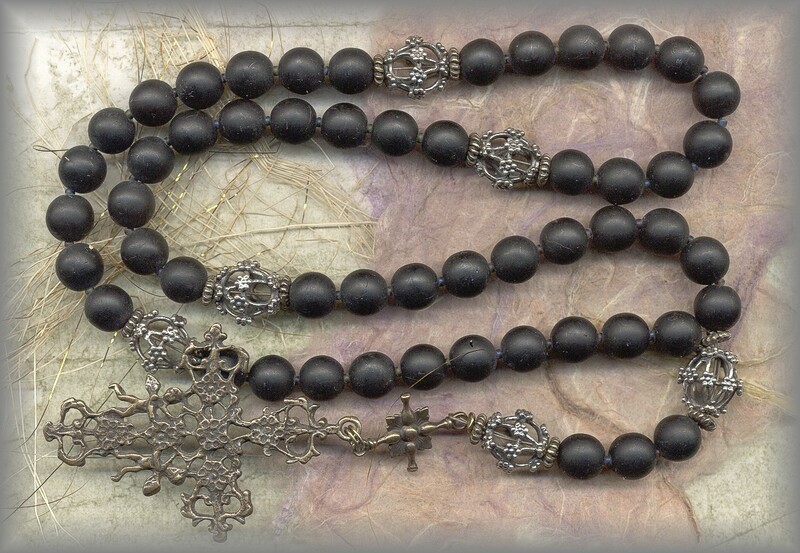 ... these early rosaries and chaplets were made - not from items purchased at a store to create a commercial rosary - but from a collection of rare beads and crucifixes that are inspiring - to create a beautiful art form that one can pray. 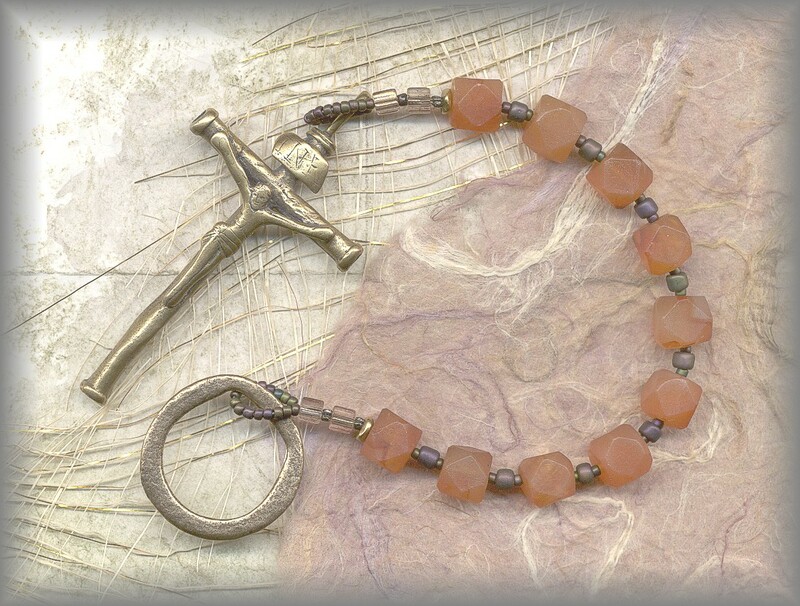 The pieces below were inspired by museum prayer beads, rosaries and chaplets. 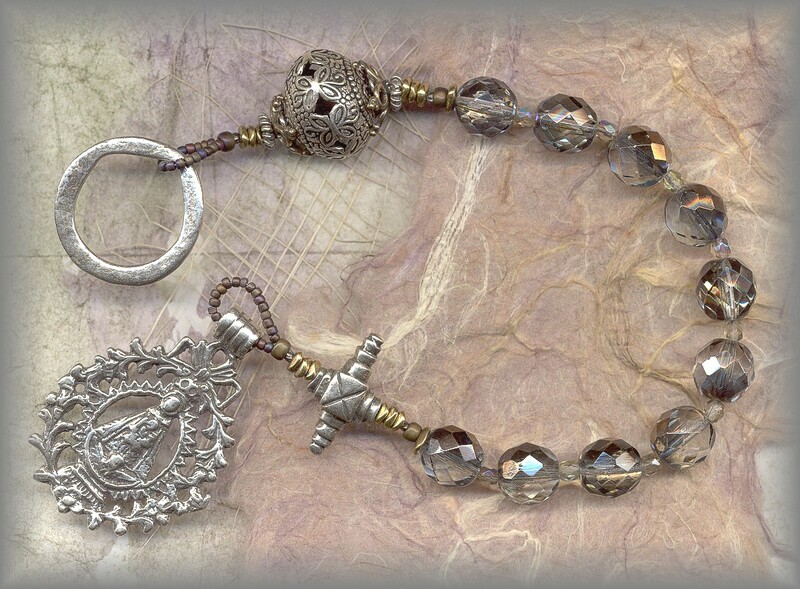 The one above is a pomander rosary inspired by renaissance rosaries. Pomander beads were popular during this period for several reasons, read about it! hand carved antiqued bone roses / 8mm antique: AVE BEADS - inspired by a chaplet from the book 'Der Rozenkranz' devoted to the 5 wounds of Christ. 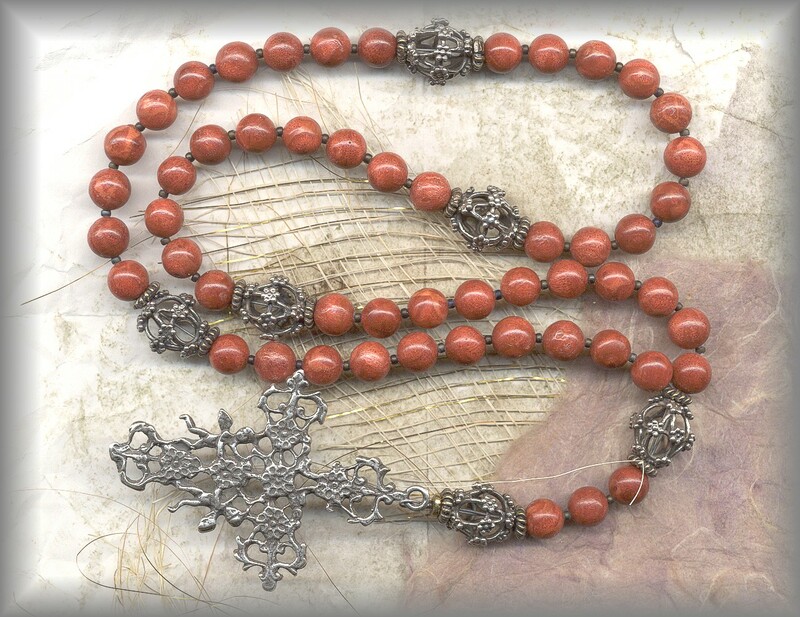 Original has 5 sets of 5, ours is regular rosary configuration. Ave bead are dated 30s (Germany). Matte coffee in color, translucent. Very PATER BEADS: Hand carved antique bone roses, flat, carved on both sides - very limited. bone discs / carved dyed bone Paters: AVE BEADS:Antiqued bone discs - Early bone discs were strapped or laced on a looped leather cord and each prayer was counted by flipping over a disc. Ours are smaller and strung but easy to count. - PATER BEADS:capped red jasper beads wth small red beads on either side of antiqued filigree caps. 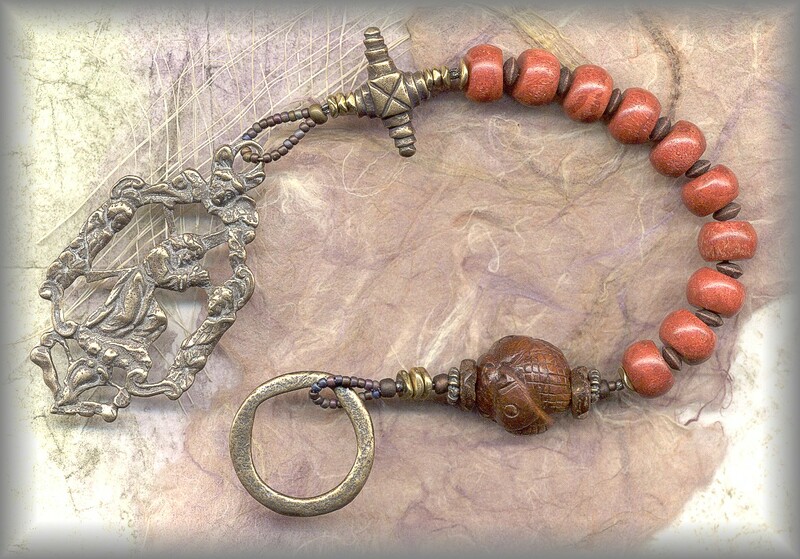 Silver filigree beads / coral root: AVE BEADS: Coral was a favorite as believed to have healing powers. 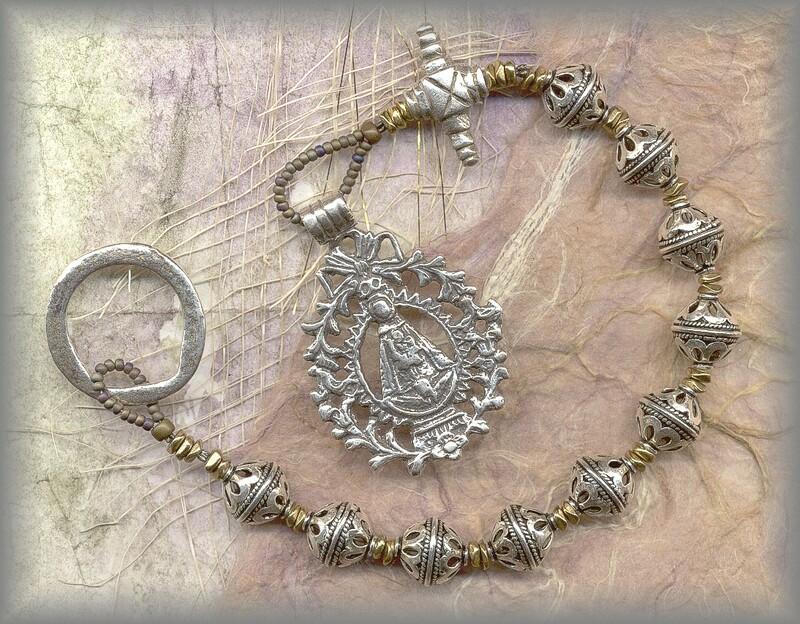 PATER BEADS: Silver Filigree bead or Pomander bead would hold herbs and spices to ward away the plague and cover the infrequent baths. 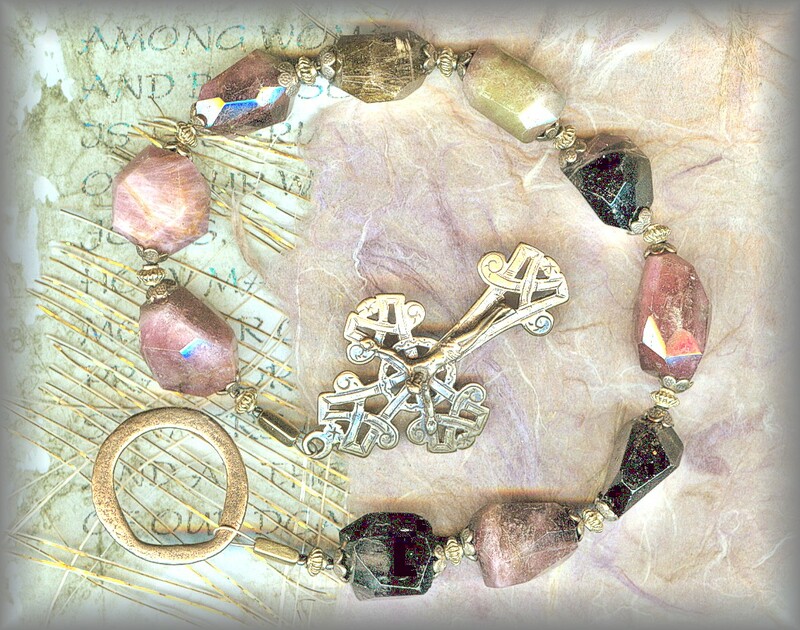 Inspired by rosaries from the Renaissance period (15 - 16c) appearing in many paintings of the period. olive pits with black glass 'acorns': AVE BEADS: Traditional Olive pits from Jerusalem PATER BEADS: are of old matte black glass beads with antiqued metal 'acorn' caps atop each. Read the history of the acorn and why it was so popular over the centuries.This series loops through the ring at the top, allowing the ends to hang freely. 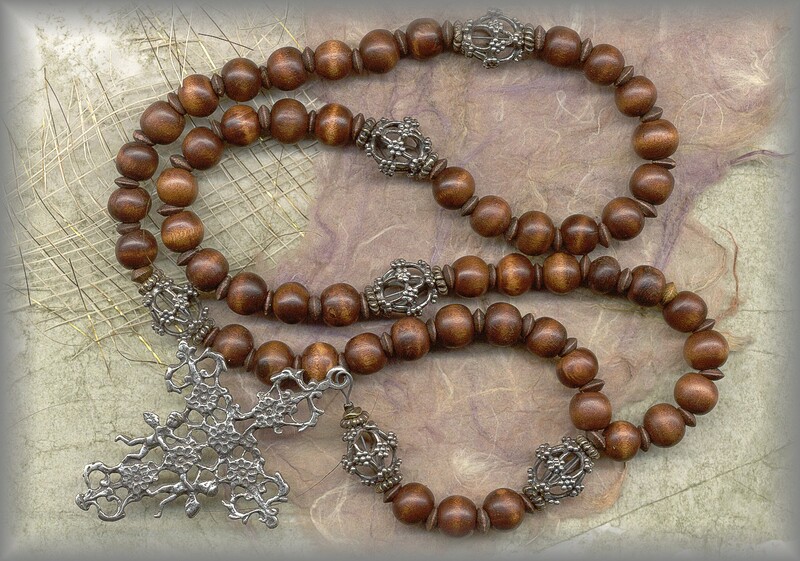 Inspired by the old 1920s 'Lasso Rosary' below made of olive pits and wooden acorns. mossy, faceted pebbles / filigrees: AVE BEADS: Mossy green flat glass pebble beads PATER BEADS: we put wonderful flowers at the ends of each to complete the design. 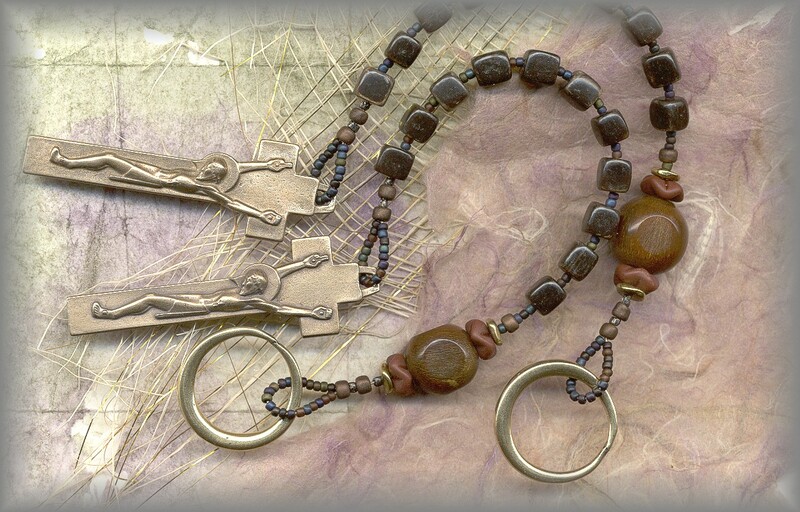 Inspired by an old olive pit Lariat rosary, also called a Lasso Rosary we found years ago. Antique dealer dated it early 20 c around the 20s. May be worn several ways. A real treasure - read more as we add to this collection. 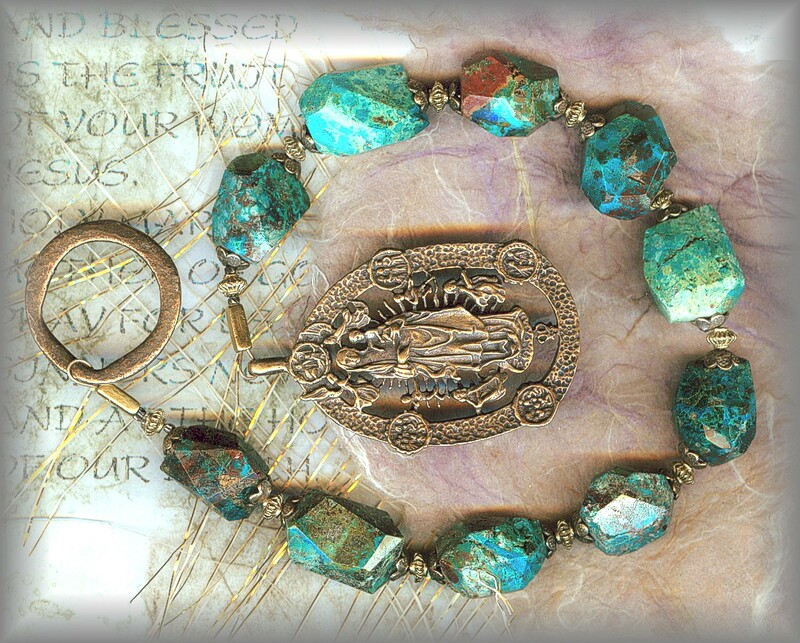 (Configuration may be applied to any of our rosaries, just ask! 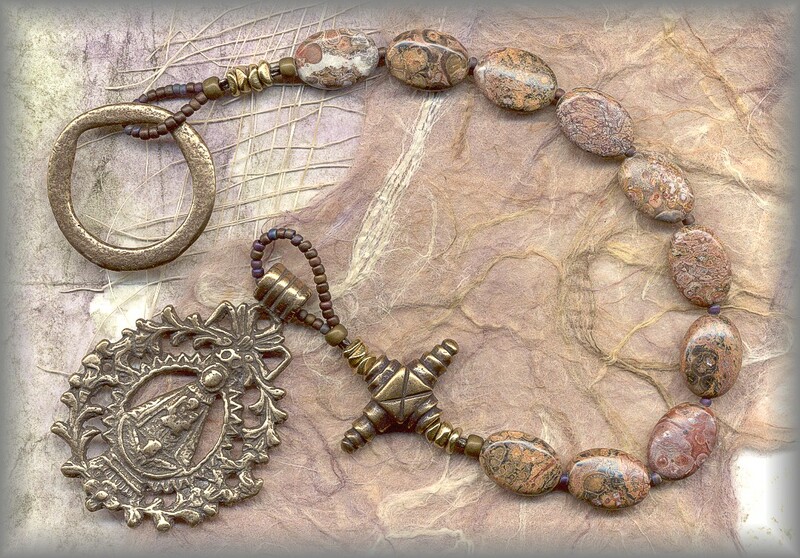 The 'Lariat' or 'Lasso' rosary is an open ended rosary that has a history. Very popular during the 20s on but it is rare we see them today. 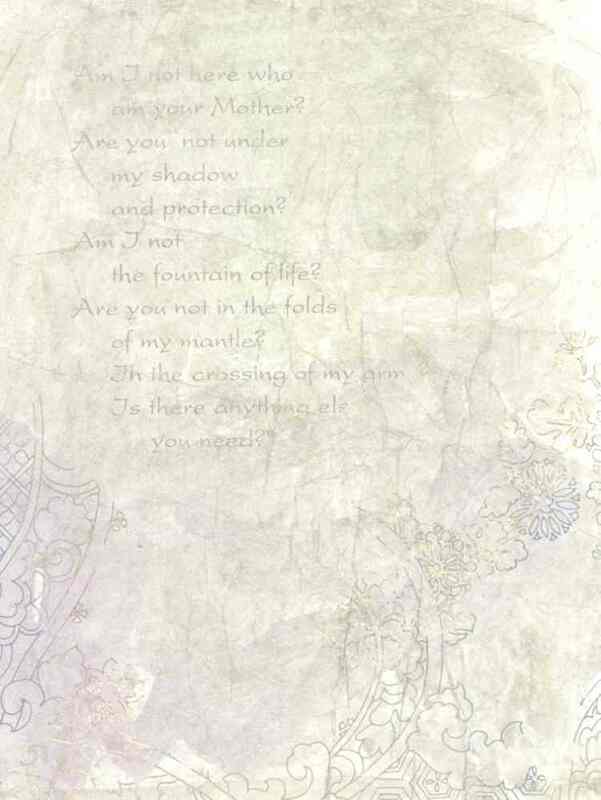 but are such a beautiful way to wear your sacramental and pray it when time allows. Note ring on the left where the loose end is threaded through once on the neck. For more information please click icon above - read about history and see the old Lasso we have on the site that inspirec us years ago. 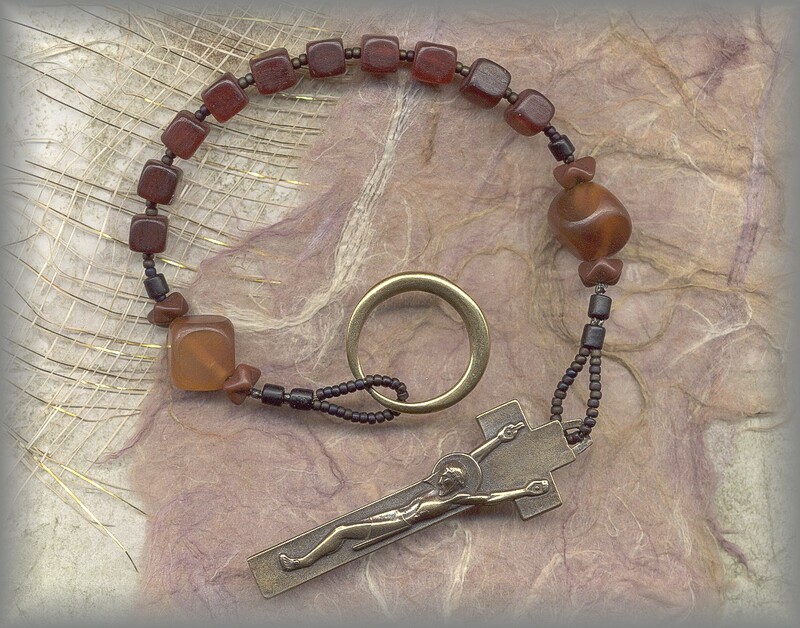 We can make any rosary on our site in this open ended configuration , for women ot men - just ask! 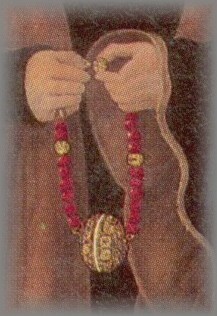 The Lariat rosary below is believed to be from the 1920s. 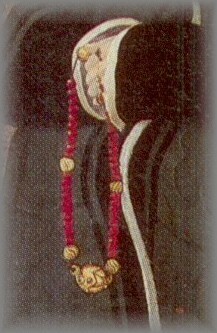 (dated by antique dealer) - During this period, long necklaces were very popular so would make sense. This one was tied with one loop. The loop could be at the top of the neck for a choker look or further down as desired. A lasso (pron. : /?læso?/ or /læ?su?/), also referred to as a lariat, riata, or reata (all from Spanish la reata), is a loop of rope designed to be thrown around a target. The Lasso necklace or loop with pendatt looks like a lasso. 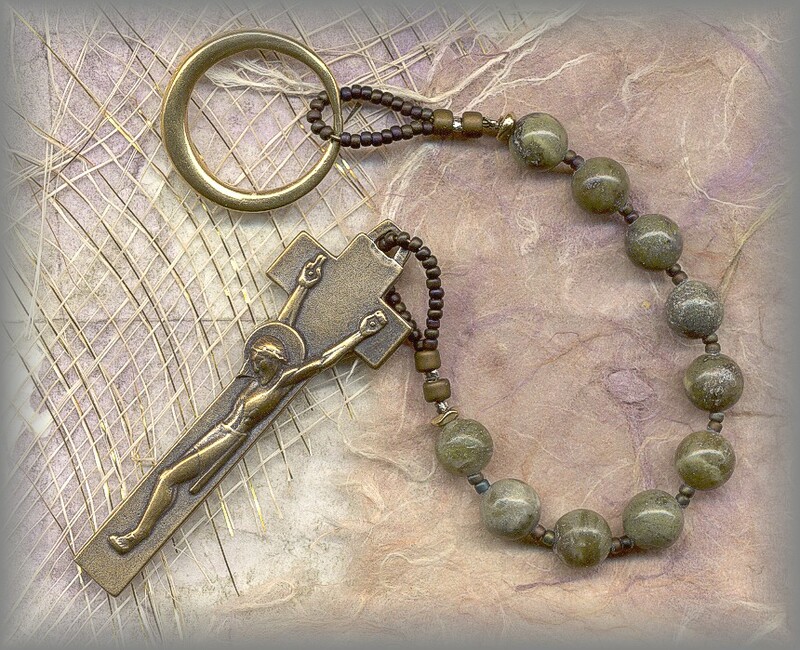 SEE THEM ALL - THERE ARE IRISH ROSARIES TOO! Working with rare components does make a difference in the finished design. 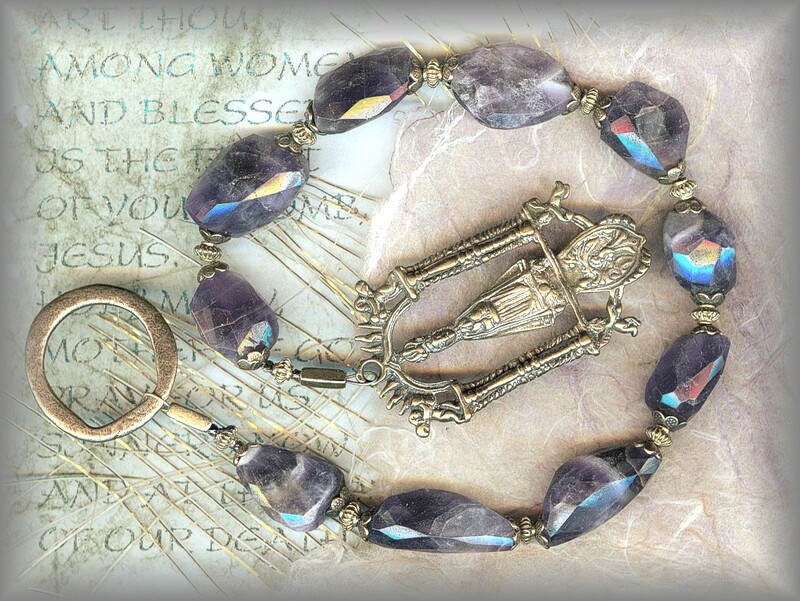 Crucifixes, rosary centers and religious medals cast from antiques in sterling and bronze along with hard to find antique beads (or those inspired by them) do make the difference. But most of all, it is in the way a designer chooses to put it all together. 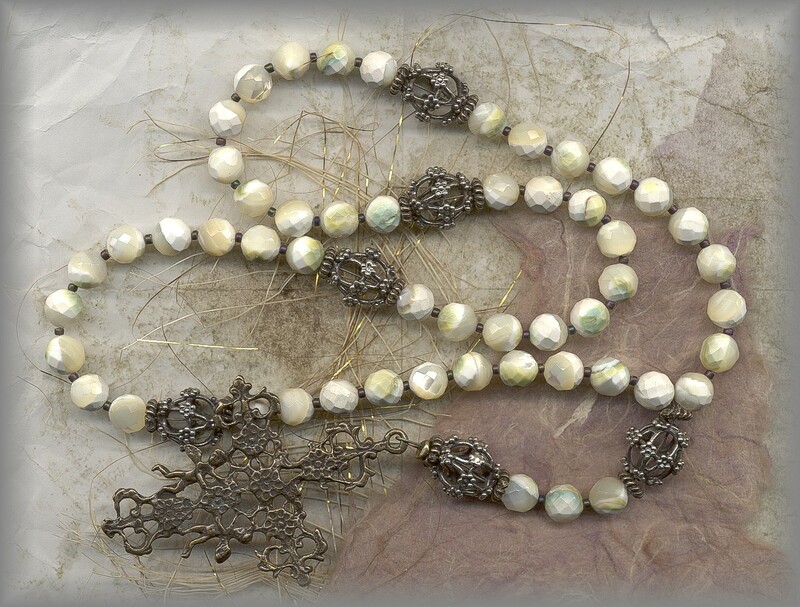 These old rosaries and chaplets from the 16 - 19c speak to the heart in a special way, regardless if they were put together by an artist or by a guild - or simply by someone who took what they had, such as a necklace, and strung it into a prayer chain. 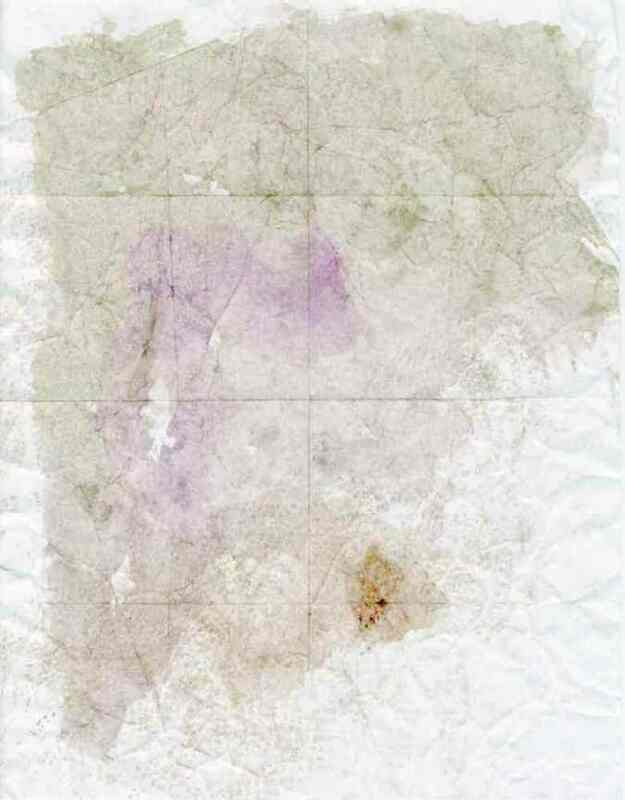 These early results are so beautiful that they are now resting in museums all over Europe. And as so many of you have said, 'they invite you to prayer'. These wonderful (10mm) beads have a history. We have used the smaller 8mm ones for many years and love the way they do become 'windows' into the inner beauty of each bead. 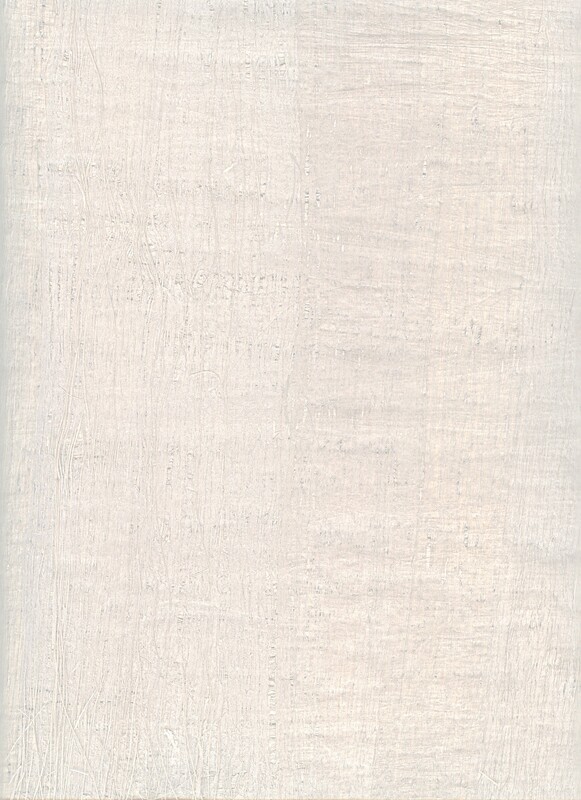 These have a marvelous range of colors, a bit translucent, sometimes opaque, but always in the process of change. No two alike. 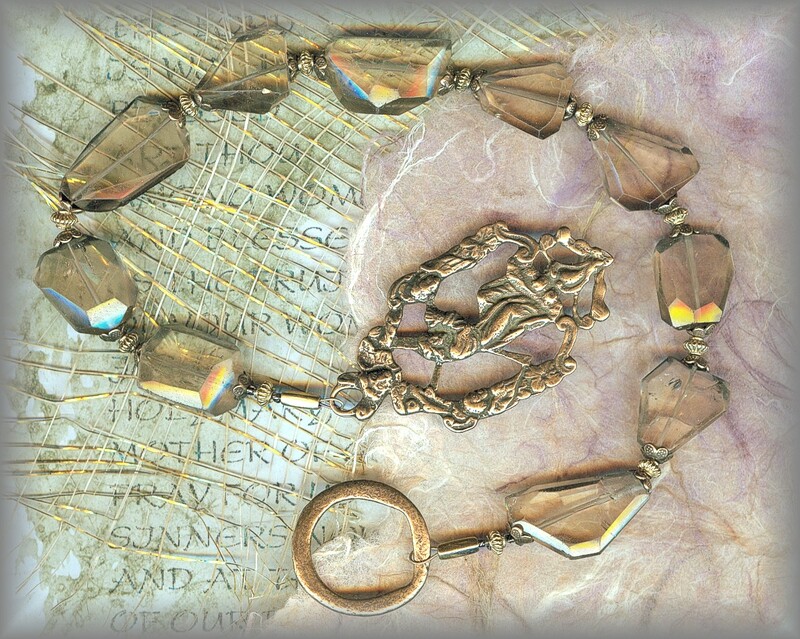 Originally, these beads were hand pressed in glass bead molds. And the design of the glass cane dictates the final bead. 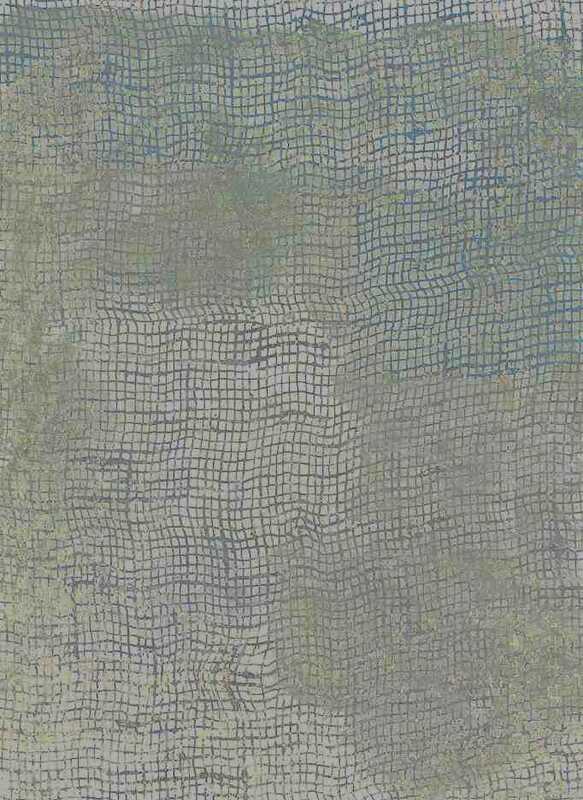 We understand the origin of this style is no later than pre WWII.